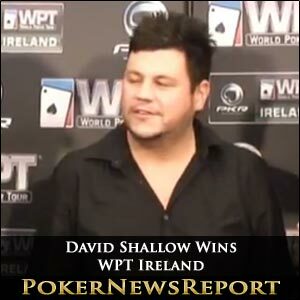 David ‘Dubai’ Shallow defeated fellow Englishman Charles Chattha in their heads-up encounter to win $289,031 and a $25,000 World Poker Tour (WPT) World Championships seat for taking down the WPT Ireland. That huge prize is easily Shallow’s biggest from nine in-the-money finishes and undoubtedly elevates him into the big time. The 29-year-old played with great skill and aggression to see off 337 other players – with many big-name pros among the starting list – to take the title at the first ever WPT main event held on the Emerald Isle at Dublin’s CityWest Hotel. Shallow was on fire throughout the €2,500 buy-in event that took four days to complete and started the final day as a huge chip leader with more than four times his nearest rival, Steve Watts. The final table should have been six-handed, but Shallow had eliminated two opponents – Steven Moreau in sixth for $40,465 and Shaun Conning in seventh for $30,349 – on the last hand of the penultimate day, so we started out with just Watts, PKR online qualifier Patrik Vestlin, Ronan Gilligan, Charles Chattha and the eventual winner. Irishman Gilligan began the final day well, even holding the chip lead for a short while, before being eliminated in third spot by Shallow for $96,339. After sending Sweden’s Vestlin to the rail in fourth place, Gilligan held 4.8 million chips to the 4.2 million of Shallow and one million of Chattha. However, Gilligan could not stay in front and was eliminated in third by Shallow. Small blind Shallow raised when holding 10♦ 9♦, only for big blind Gilligan to call with 4♥ 3♦. Shallow found top pair on the flop, although Gilligan also had an open-ended straight draw, resulting in a huge pot. The Englishman threw in 215,000 chips, only for Gilligan to raise that to 525,000. Shallow immediately went all-in and the Irishman called. The K♦ arrived on the turn but did not help Gilligan, and neither did the 8♠ river as he hit the rail in third as Shallow found himself on 7,280,000 chips and Chattha on 2,860,000 as their heads-up battle started. The gathered railbirds saw a thrilling match-up as Chattha managed to squeeze Shallow to the point where he actually had the chip lead at one point. However, Shallow was not in the mood to capitulate and, once he had regained the chip lead, there only appeared likely that there would be one winner. The final hand saw Shallow raise to 135,000, before Chattha three-bet to take that 380,000. But Shallow – who plays online as ‘CrabMaki’ – then made it 825,000, which then saw Chattha move all-in. Shallow called to be way ahead as his Q♣ Q♦ came up against Chattha’s 9♥ 9♦. The board showed K♣ K♥ 2♦ 8♠ 3♠ and that was that as Chatta left with $144,502 for his runner-up spot. The final day’s first casualty was London’s Watts. Gilligan, on the button, raised, only for Watts to go all-in for just over 1.1 million. Gilligan called with A♣ K♦, while the Englishman showed 10♣ 10♠ to be ahead. However, Watts certainly did not want to see another 10 when the flop showed Q♥ J♥ 7♠ flop to hand Gilligan a straight draw. The 9♠ on the turn was a safe card for Watts, but the 10♦ arrived on the river to give Gilligan that straight. With Watts out in fifth place, the next player to go was Vestlin for $51,063. In the cut-off seat, Vestlin raised and was called by big blind Gilligan. The Irishman checked on a flop of 9♠ 7♠ 3♠, allowing Vestlin to make a bet. However, Gilligan check-raised to make it 450,000 to go, only for Vestlin to go all-in for 1,750,000. Gilligan called with J♠ 9♦ for top pair, while Vestlin showed A♠ Q♣. The Swede must have felt fairly positive, though, with a flush draw looming to double up. Unfortunately, for the Swede, the 10♣ arrived on the turn and river of 8♣ changed nothing. That left Gilligan, Chattha and Shallow to battle it out, with the last-named eventually emerging as the latest WPT champion. Meanwhile, Ken Doherty, the 1996 world snooker champion, hit the rail in 14th place for a rather handy $10,116. The Dubliner certainly enjoyed his run and, with any luck, we’ll be seeing a lot more of this talented poker player in the near future.